Perhaps I'm a bit odd, but as a writer words excite me. ;> Especially interesting, or unusual words. I've always had a bit of a love-affair with the English language, and finding weird words is a bit of a hobby. In lieu of anything important, I decided to post my favourites. These words all need more love! Some are long, some sound funny, but all are fabulous. And hey, maybe you'll learn something new! ♥Amalgam - A mixture, union or combination of ideas. ♥Abyssopelagic - relating to the very bottom of the sea. ♥Agrestic - rude or aggressive. ♥Bumbershoot - an alternative word for an umbrella. ♥Cathartic - a release of emotion. ♥Confabulate - to chat with someone. ♥Corpulent - a polite way of saying 'extremely fat'. ♥Floccinaucinihilipilification - to describe something as worthless. ♥Flummery - nonsense, empty compliments. ♥Hobbledehoy - a clumsy youth. ♥Icythyophagous - something that feeds on fish. ♥Quixotism - idealism without regard to practicality. ♥Saccharine - cloyingly, overpoweringly sweet. ♥Sesquipedalian - long winded, ponderous. ♥Shenanigans - mischief, silly behaviour. ♥Syzygy - when three celestial bodies are aligned. No idea when you'd need this, it made the list for having a ridiculously cool spelling. I challenge you to get it into your next piece of writing. I also challenge you to say it aloud without having it sound like a sneeze. ♥Tatterdemalion - a raggedy person. ♥Zenith - the highest point reached by an object, or the point in the sky directly above you. Oh! And if anyone follows my twitter, you'll know about Oliver. 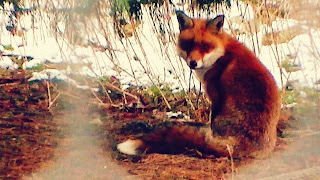 He's the fox that appeared at my work with the birds over Christmas, and he is completely unafraid of humans! He sits maybe five metres away from where I am in the aviary with the birds, and watches me. When I watch him back, it doesn't bother him at all. At first I thought he might be injured or sick, but he's not - he looks absolutely beautiful. We put out food for our tame crow Russell, and he's been helping himself :> And he is so cute!I managed to snap this photo of him while I was inside the aviary. It's taken on a video camera so the quality isn't all that good (had to zoom in a lot) but here he is! Isn't he just darling? Yes! :> I need to find MORE words, these are quite simply not enough!